In the 1930's the German people were sucked into a political ideology that knew no boundaries. Religion that they thought they knew was abolished and replaced with a rabid form of Christianity that the world was far from prepared for. It was so vile, so perverted, that even those who first thought they knew what they were buying weren't ready for what came next. They were sold a bill of lies that was prepared for them by a man, by his cronies, with no discernible faith of his own. In affect, it was the abolition of faith. It was the creation of a new world to which my family did not belong. From the mid 20's Hitler had begun leaking his hate filled propaganda into the mainstream of German society. Rejected at first, Hitler didn't back down. With a relentless perseverance the architect of the Holocaust began to lay the foundation for his master plan. With every drop of his poison the well from which the German people drank became even more bitter. Yet the taste of taste of the antisemitic taint wasn't stopping the Germans from lapping it up. The end result was a German society that was not just complacent in the Holocaust but a society which fought tooth and nail to defend the destruction of European Jews. When faced with the opportunity to abandon the Nazi's ranks the German people routinely decided to take up their rifle and fight to maintain the status quo. It took decades of dealing with their sins before the majority of German citizens would even admit that what they helped Hitler accomplish was wrong. This path to power is a well traveled one. A dictator doesn't take control through force that often. It is most often accomplished through coercion and feeding the poison with some honey. In the case of the Germans the honey was a long standing strain of antisemitism that had predated Hitler. The long history of Europeans scapegoating Jews was a strong cornerstone for Hitler's propaganda. It wasn't a far leap from England's 13th century expulsion of the Jews to Spain's Inquisition. All Hitler had to do was follow the cobblestones upon which his predecessors had built. Today the long history of European antisemitism is clearly visible in the Middle East. Where Hitler had made progress with a German audience the dictators of Arab societies find inspiration. When Goebbels depicted Jews as rats the world ignored it. When Arab cartoonist depict Jews as rats the world once again ignores it. 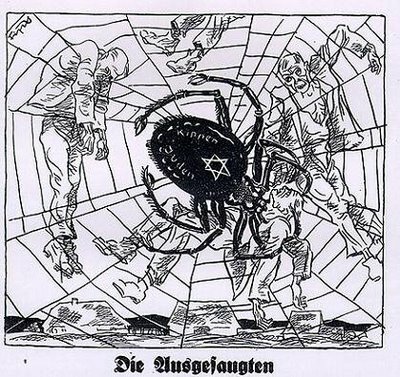 When the Nazis spread the image above depicting Jews as a giant spider drinking the blood of "non-Jews" the world looked the other way. When Arab artist depict Jews as spiders in the scarfs of Hamas guerrillas and make cartoons depicting blood libel... well the world once again looks the other way. The cartoons are often childish and make no distinct argument when standing on their own. But that is the reason Hitler liked this form of propaganda. It allowed the viewer to cast their own bias upon an image that was characteristic of party policy. It allowed a bond to be formed through playing to the emotions of the audience rather than encouraging intellectual debate. This was the method of Nazi propaganda because it doesn't permit the viewer to think for them self. Instead it desires to replace the thoughts of the individual with the suggestions of the masses. Over time the hatred for a targeted group (either ethnic, religious, or political... ext) can be built up by allowing the viewer to assume that they have control. Yet over time the control of the audience's thoughts and emotions is handed over to the regime. Through the power of suggestion the party is able to replace the citizen. Through the power of playing to the least common denominator the group commits it's first murder... the death of the individual. Goebbels was a master at murdering the senses of the individual. Portraying small crowds as giants in the minds of the onlookers he was able to make the individual believe that their life would be made meaningful if only they succumbed to the influences of the masses. When Goebbels finally did have enormous audiences to film he turned the tables and began to depict the minority. Switching the bait, Goebbels knew that the individual was already dead to their own senses. All Goebbels had to do was mold the bricks so that they would fit into Hitler's plans. Once the bill of lies was sold there was no turning back. Hitler could build up his empire with a nation of useful idiots. What had once been a nation of individuals was now a country of numb (scared) masses. They would act as one. They would kill as a group. This was Hitler's pack of wolves now. Those who would not fall in line were subjected to cannibalism. Like dogs, the weak were made to roll over so that their throats could be gashed. Nazism is a brutal ideology in this light. Both Israel and Palestine have toyed with the art of recreating the sins committed by Goebbels. Neither can hide where they have played the role of propagandist. While Israel attempts to erase the individualism of the Palestinian the Palestinian Authority attempts to dehumanize the Israeli all together. Settlers, occupiers, invaders... Terrorist, jihadist... the hate between the two states is more than just a war of words. It is a vile contempt for the existence of the other. In Israel the state is more open about it's propagandizing. Painting the settlements as vital to the security of the state the creators of this propaganda play to the fear of losing security... the lack of control. While here in America we are often prompt to remember the words of Benjamin Franklin we too get sold that same lie time and time again. For Israel however the fear of insecurity is rather real and palpable. It is highlighted every time a rocket comes over the border. And it is for this reason the propaganda that is created to capitalize on this fear is so effective. As long as Israel is capable of being manipulated into selling it's morality and liberties for the belief that tyranny will somehow bring security they will have to live with insecurity. There is not a population of people on the planet that would tolerate the police state like presence that has been imposed upon the people of the West Bank, Eastern Jerusalem, or Gaza. Barbed wire, concrete walls, landmines, and trenches don't make good neighbors. In the case of Gaza, fences don't make good ones either. If Israel is to find safety in the face of a foe that has threatened it for so long they will ironically have to soften their appearance. A human being is not designed to trust another when they have to look at them through barbed wire. It is just that simple. Yet at the same time Palestine has to break with it's long history of propaganda against the "Jew". If it is to exist in any form it will have to distance itself from groups that would paint the descendants of Holocaust victims as modern day Nazis. This slur, above all others, is the quickest way to bring back up the bricks and build back up the walls. There is simply no rationalizing with a people that would pick at old wounds till they can draw fresh blood. However cantankerous these past few paragraphs may have come across they are just the tip of the iceberg. The decades of propaganda must be deconstructed. 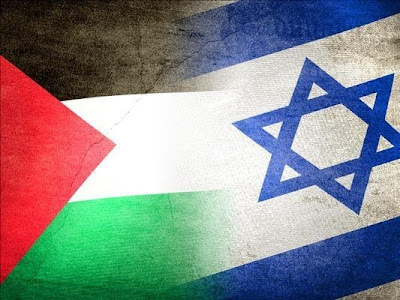 The lies that have been woven into the fabric of Israel and Palestine must be pulled apart thread by thread. If they are not there will never be a lasting peace. We are not designed to forget what has not been banished from the present. As long as one of the two is ready to rehash past offenses there will be no moving forward. The grudge can't be our building block for a common future. In future post these lies will be picked apart without relent. For these are issues that have created some of the most heinous crimes of our time. These are the lies that have pitted brother against brother. These are the lies that have led us to kill Abel over and over again. For this reason we will painfully rip them apart and uncover that which they were designed to hide. We will explore why the history of two peoples has been slandered to the point that most can't recognize their own past. We will discuss why the state and the stateless are at war with one another. And we will take a brutally honest look at the resulting atrocities of this conflict. We ask that you stick with us. We ask that you leave your bias behind and join us as we attempt to walk through this field of landmines. We ask you to do what our predecessors have failed at... leaving the partisan ranks and walking out under a white flag. Jews, Muslims, Palestinians, Israelis... those titles don't matter to us here. We will not be just more bricks in the wall that divides us. Are you ready to stop being lied to?